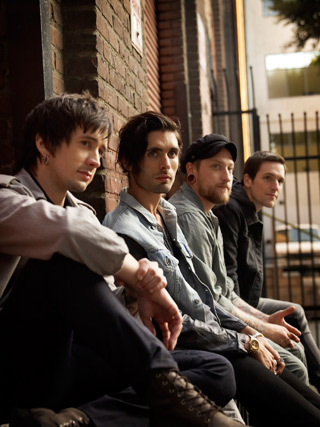 PUEBLO - Recording artists The All American Rejects will help celebrate the end to the 2015 Spring Semester at Colorado State University-Pueblo with a concert at 8 p.m. on Friday, April 10 at Massari Arena. The concert is coordinated by the Office of Student Engagement and Leadership with funding secured by the Student Fee Governing Board. An American band based in Stillwater, Oklahoma, The All-American Rejects formed in 1999, consisting of Tyson Ritter (lead vocals, bass guitar, piano), Nick Wheeler (lead guitar), Mike Kennerty (rhythm guitar), and Chris Gaylor (drums, percussion). The band achieved mainstream success with their debut self-titled studio album, The All-American Rejects, released in 2003 by Dreamworks Records. The album was certified platinum by the Recording Industry Association of America (RIAA) and spawned the single "Swing, Swing." The band's second album, Move Along, brought the band further mainstream success in 2005, producing the hit singles, "Dirty Little Secret," "Move Along," and "It Ends Tonight," all of which hit the top 15 on the Billboard Hot 100 chart, while "Move Along" was certified double platinum by the RIAA. Their third studio album, When the World Comes Down, was released in 2008 and was later certified gold by the RIAA with its lead single "Gives you Hell" becoming the Rejects' most successful song to date, peaking at #4 on the BillBoard Hot 100 and the top five in many other countries. "Gives You Hell" was certified 4× multi-platinum for sales of more than four million in the United States. The band's fourth studio album, Kids in the Street, was released in 2012 and debuted at #18 on the BillBoard 200 chart. Non-student tickets may be purchased at $25 per person either online or in person from 9 a.m.-4 p.m. Wednesdays and Thursdays at the Massari Arena Box Office. CSU-Pueblo students must obtain their tickets ($10 each, two allowed per student rate) at the Massari Arena Box Office ONLY. CSU-Pueblo students must present CSU-Pueblo identification at the box office to purchase tickets. On the day of the concert, Massari Arena doors will open at 7 p.m. with an opening act beginning at 8 p.m. No backpacks, bags, or purses of any kind will be allowed in the facility.